The Lower Casita has a bedroom with king size bed (sleeps 3), full bath with hot water, and a comfortable sitting area with satellite television and a kitchenette. The kitchenette is furnished with fridge, stove, microwave, coffee maker, toaster, blender, dishes, silverware, pots, pans and bottled water. 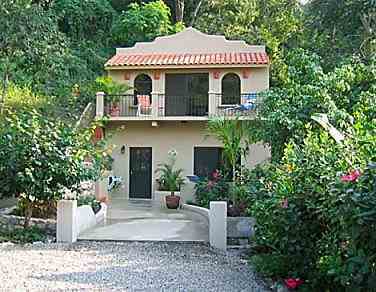 The photo above is the outside, the inside is similar to the Upper Casita (inside photos coming soon). Both the upper and lower casita may be rented if more space is desired (J-14 on the map).